I am slowly but surely going through the polishes Zenorah sent me. When I first saw this one in the package, I have to say I was kind of disappointed. This picture doesn’t show the true color AT ALL! In real life, the color in the bottle is a vibrant bright purple creme. So bright that my camera freaked out and this was about picture 30 before I gave up and realized that the color was just too intense for my camera to pick it up. I’m not a huge fan of neon purples, which I though this was, until I forced myself to wear it. After applying it, I was in love. While in the bottle it appears like a neon purple, it actually does show up more royal blueish purple on the nails. It is much darker on than it shows up in the bottle, and I mean at least 2 shades darker. 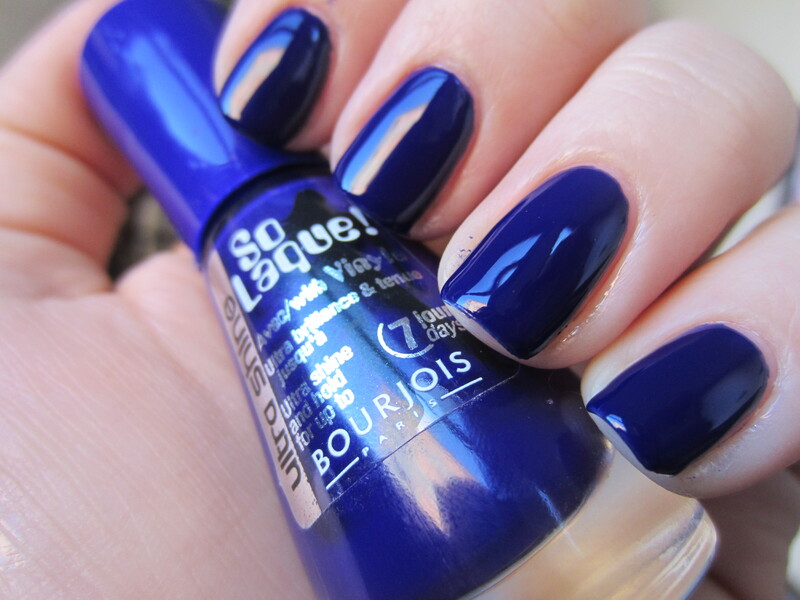 Bourjois “Bleu Purple” (creative name right) was really opaque but not that easy to work with. It was a thick and goopy and didn’t dry that fast. I thought it was an ok dry time and I added my staple Seche Vete top coat, which seems to make my nails dry faster all on its own, and then 20 minutes later I went to the bathroom. Normally, I never have an issue. Actually, I painted my nails about 10 minutes ago and I’m typing away without a problem. But this polish never seemed to dry even with Seche as a top coat. I wish I didn’t love the color and love how glossy this is because it would save me a lot of time and heartbreak.